Deaf Dog Awareness Week is Sept 24-30 and Deaf Dogs Rock is celebrating by inviting the international deaf dog community to share photos and stories about their wonderful dogs. Some of these dogs have been certified for therapy work and many have achieved champion-level agility status. 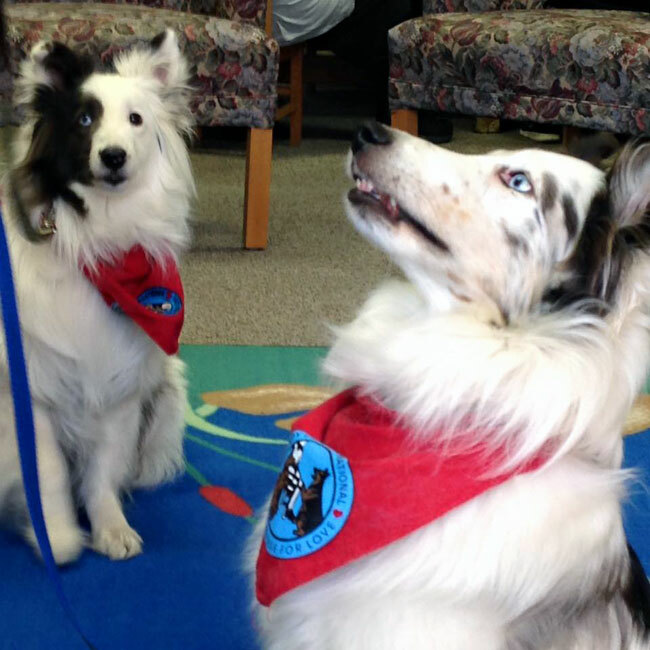 Certified therapy dogs Sky and Olaf (aka the Dynamic Deaf Duo) visiting a library to participate in a reading program for children. 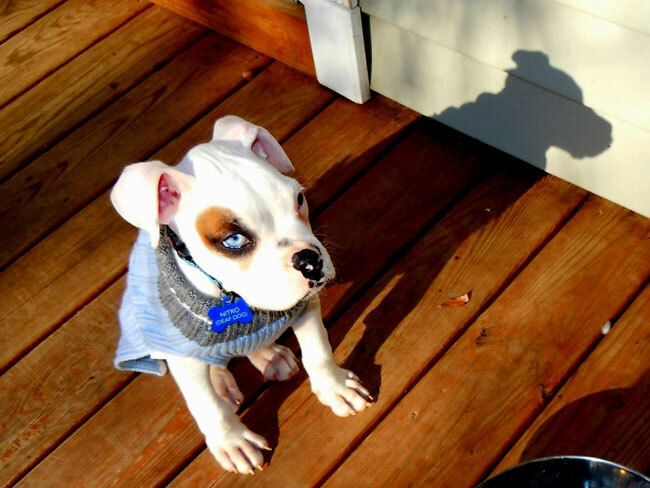 Lee’s deaf dog journey began after she adopted Nitro, a boxer, who was dumped by a river in Salem, VA. 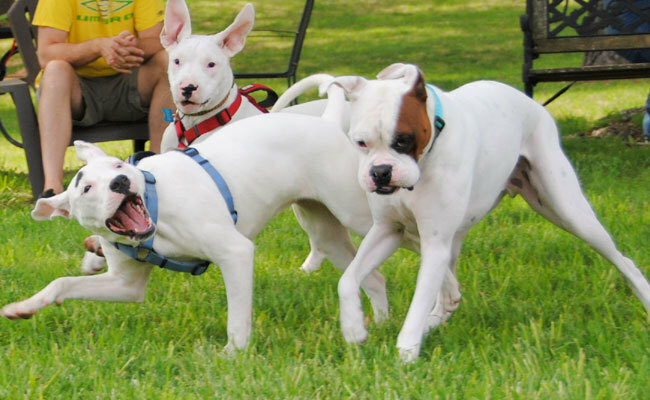 Following a brief “freak out” moment when she realized how detached Nitro was, Lee and her husband, Chris, quickly devoured everything they could about training deaf dogs. Following a combination of “watch me” and tether training, Nitro turned into Lee’s shadow and followed her everywhere she went. “I remember the light bulb going off for him—that look of excitement when he realized that I was communicating with him,” said Lee, who is now the proud mom of four deaf dogs. Nitro adjusting to his new home just days after being adopted from the Salem Animal Shelter by Christina and Chris Lee of Deaf Dogs Rock. Nitro started puppy class and got through first, second, third and fourth level training in just a few months. He achieved his Canine Good Citizen certification by the time he was 10 months old. At the community dog park, while other owners struggle to get the attention of their hearing dogs, Nitro is laser-focused on Lee. When she signs that it’s time to leave, Nitro meets her at the exit gate. Lee was blown away when Nitro completed an agility course on his own just moments after she had taught him how to tackle the obstacles. Deaf dogs hear with their hearts. They not only love the humans in their lives but they also love the other dogs in the family. They are the ultimate Velcro dogs—no matter where you are located in your house you will always have a second shadow following you around from room to room. You can play rock/country/hip hop/rap music or sing in your car, at home or in the shower as loud as you want and your deaf dog can’t hear you. You can take a deaf dog to big events like pet expos and they can’t hear all the other dogs barking. You can do a big construction project in your home and your deaf dog will never hear the nail gun, hammer or saw. You can sneak into the kitchen for a late night snack, open a bag of potato chips and your deaf dog doesn’t wake up. Deaf dogs don’t chase the vacuum cleaner but instead enjoy the vibration that comes from the suction of the device. Deaf dogs excel in therapy dog work, emotional support dog work and as service dogs because they don’t have a fear or anxiety that usually comes with loud noises like hearing dogs do. Deaf Dogs Rock because they are not afraid of Fourth of July fireworks or thunderstorms. There are many ways to support Deaf Dogs Rock in its mission including sponsoring a deaf dog, paying for a spay/neuter, purchasing food and treats or supporting the transport of a deaf dog in need. Previous Previous post: Does Adding a Younger Dog to the Family Revitalize a Senior Dog?